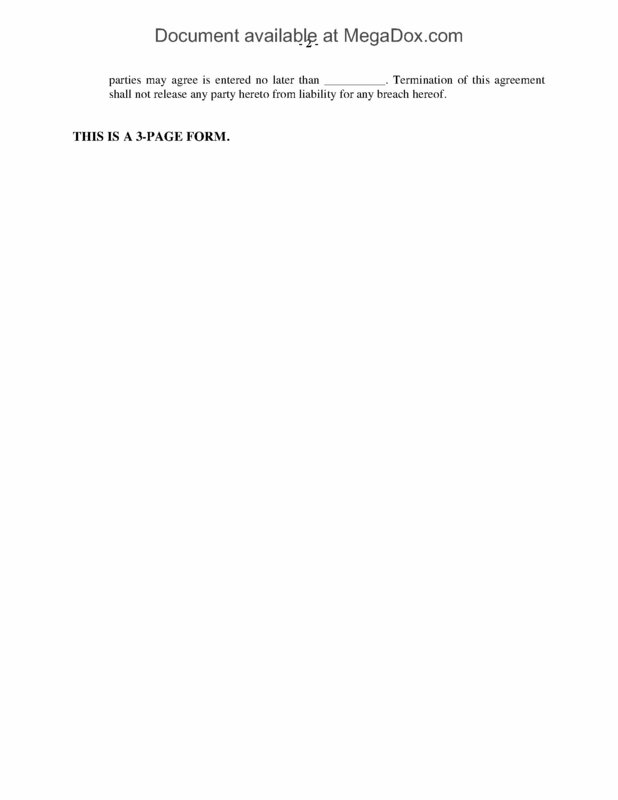 Make an offer to purchase an interest in software and source code with this Offer to Purchase letter template. If the offer is accepted, the purchaser will acquire an undivided interest in the software. As co-owners of the software, neither the seller nor the purchaser would be obligated to account to the other for income or expenses. Closing of the transaction will be conditioned on the purchaser completing a satisfactory due diligence review. Termination of the offer will not release either party from liability for any breach of the terms of the offer. 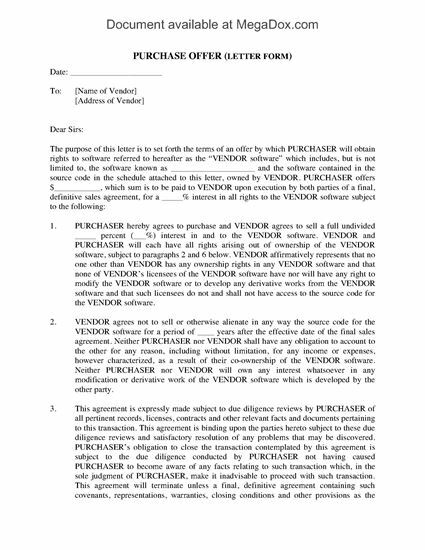 This Offer to Purchase Interest in Software template is provided in MS Word format. It is fully editable and can be easily modified to encompass all the terms of your proposal. 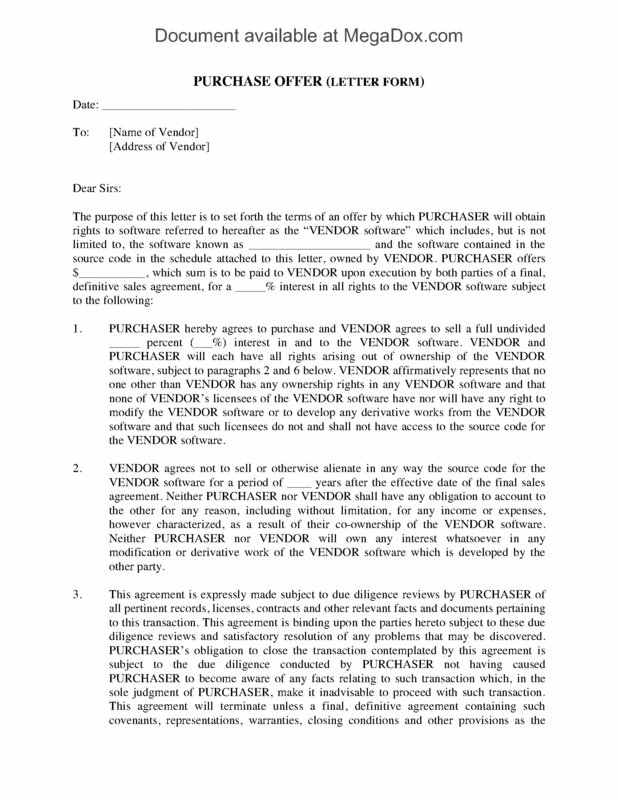 Negotiate the terms of an agreement to purchase software licenses with this Letter of Intent template. The parties to the transaction will be (i) the developer who holds the licensing rights to the software and (ii) a party who will purchase licenses for the software, for resale purposes. The parties will not solicit or entertain any other offers for the purchase of the licenses unless and until negotiations between them have been terminated. The purchaser agrees to pay a breakup fee if negotiations are terminated for any reason other than a breach by the developer. Both parties agree to keep all information exchanged between them confidential. The parties will continue to negotiate in good faith until either a definitive agreement is executed or the letter of intent expires. This digital template is generic (not country-specific) and can be used anywhere. You can download the Letter of Intent form right after you pay for it. Add it to your cart and check out.